Just because you don’t have a super master suite, doesn’t mean you can’t create a space for a bit of pampering. These 15 corner vanities will add a bit of luxury to your bedroom – as well as providing more function to your mornings. 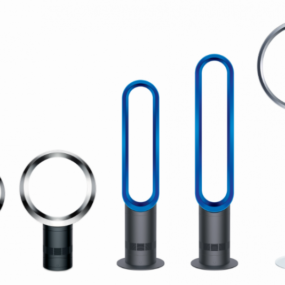 Check out these innovative designs below! 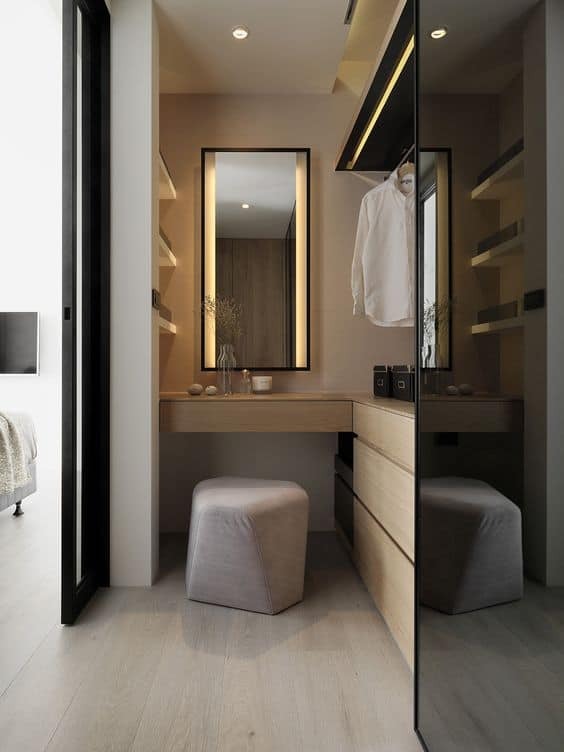 If you’ve got the right size nook, you can buy or create something similar to this design we found over on Pinterest. This cottage-style bedroom is complimented perfectly by this wooden desk. 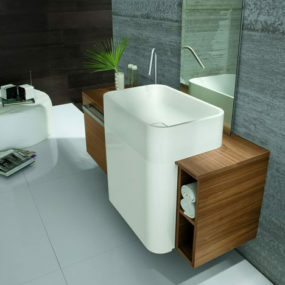 It’s quaint, it fits the smaller space and still provides the function you need to make your mornings a bit cheerier. Just because you’re searching for a corner piece doesn’t mean that it has to be small. 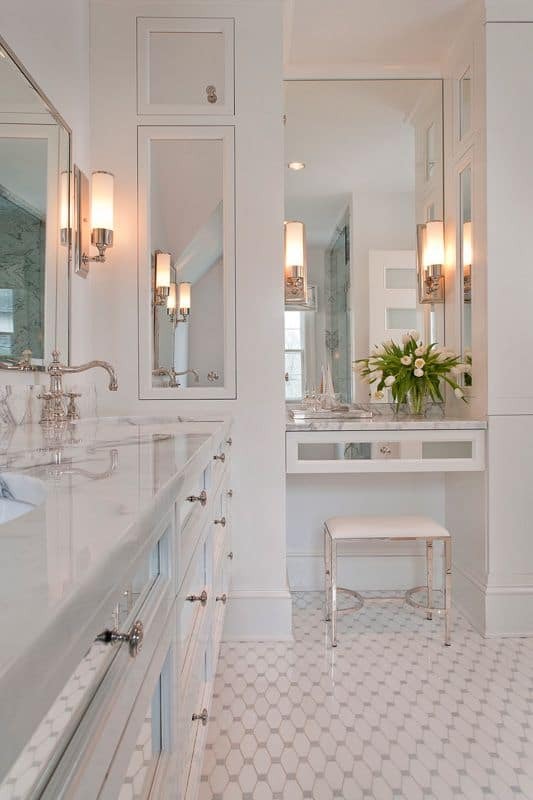 Check out this beautiful, Victorian-style design we found while scrolling through Pinterest. 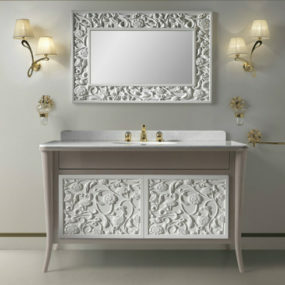 Larger bedrooms or those that need a bit of extra oomph for the bare corners, this vanity will work. Overstock has this simple corner desk available to buy for a price point that will fit a lot of budgets. But what’s great is the versatility of the design. 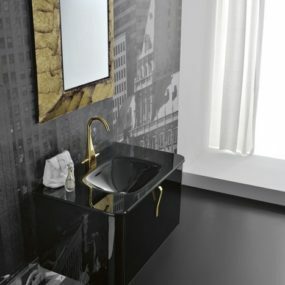 Of course, you can use it in the home office or the hallway, but it’ll work inside the bedroom too for those that are looking to build a vanity space. Were swooning for this little corner spot. 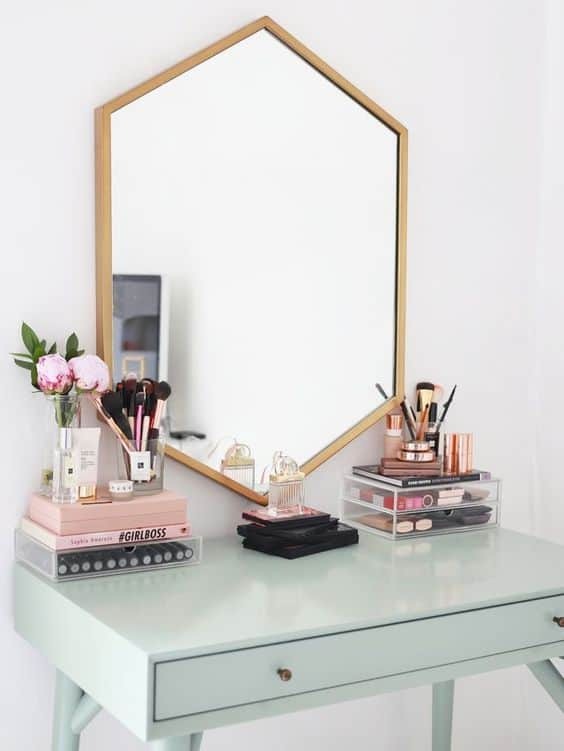 With the minty sage desk and the golden-framed mirror, you get a feminine and modern space to get ready at every morning. 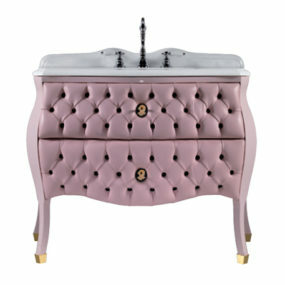 It’s trendy and chic, and you can personalize it without fear of clutter. The acrylic organization on top only adds to the neat, contemporary vibes as well. PopSugar gave us this contemporary space as well. Of course, black and white is a classic, go-to color combination that will bode well in most rooms. But the fact that this simple desk design fits right into the nook helps to utilize every part of the area. Top it with some organizational bits and you’ve got an easy-to-use area for morning routines. 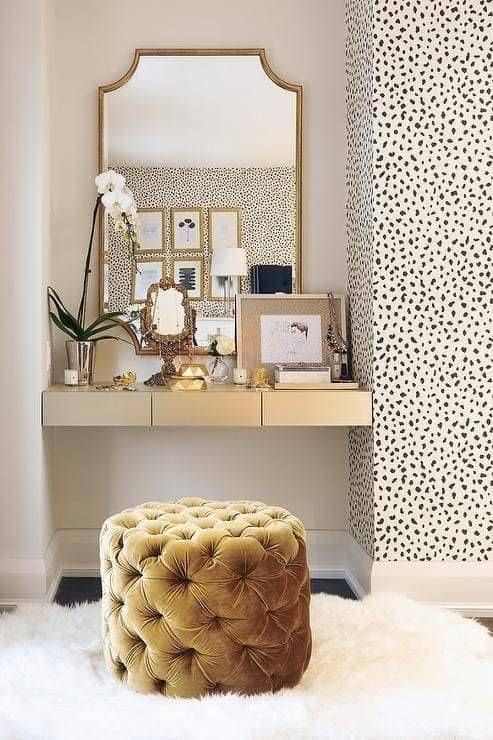 If you’re looking for some style inspiration that’s a bit more glam, then check out this golden nook from Domino. It’s a floating desk that, again, can be fit inside any cranny or corner that you have free in your bedroom. This utilizes spare space and lets others parts of the area kept free of clutter. Or, you could create an entire corner vanity space inside your walk-in closet, if you’re smart about it. 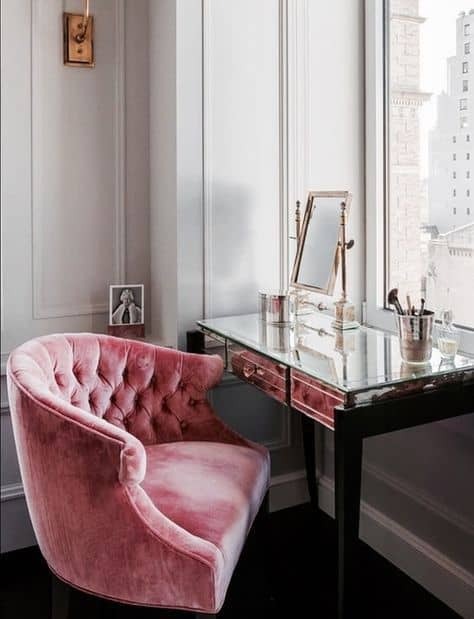 All you need is a mirror, a table top and a pouf to get yourself started. Thanks again to Pinterest for offerings loads of inspiration and ideas. This space is both male and female friendly as well, so you both can utilize its function. 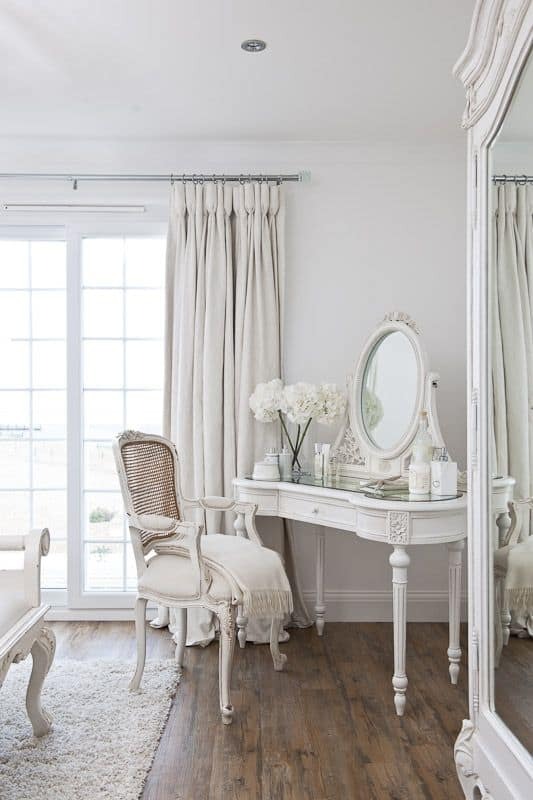 Ashley Brooke Designs let us have a peek into this super-glam vanity space and we instantly fell in love with the simplicity and feminine appeal. 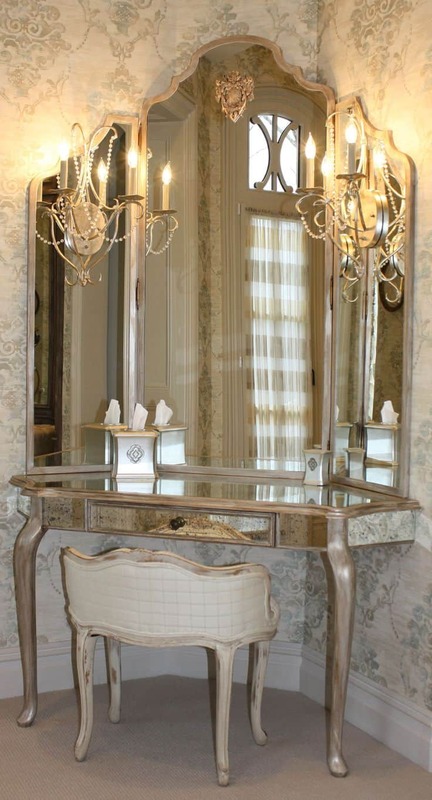 The velvet, tufted chair accents the fine lines and sharpe features of this mirrored, glass desk nicely. And it’s such a light and bright area to utilize for all of your makeup and prepping needs. 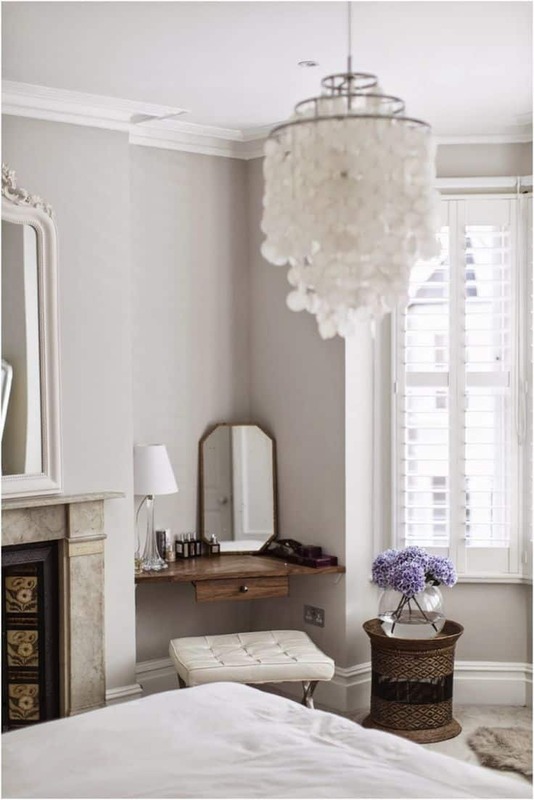 Here’s another beautiful example of mixing up textures to create a lush and feminine space to enjoy. 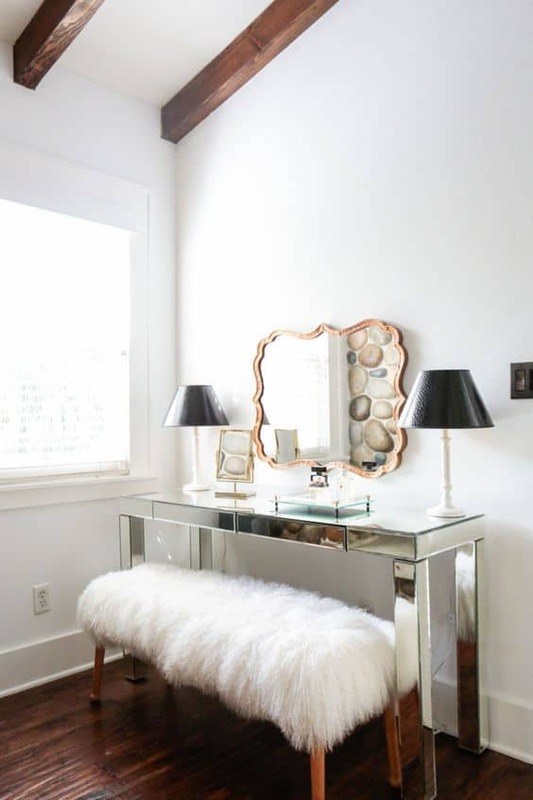 The shaggy bench paired with the glass table make for the perfect foundation of a corner vanity area. It’s functional and stylish, which is everything we love about the inspiration found at Home Polish. 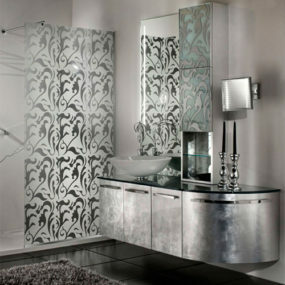 If you visit Marcus Design, you’ll get some design ideas for turning a corner of your master bath into a vanity space. Instead of having all of the makeup and hair good clutter the countertops, turn one of the nooks of your spacious room into an area just for that part of the morning routine. It adds a bit of luxury those early house, and who wouldn’t want that? Caitlin Wilson went with the mixed textured for an extra pop and bout of interest. 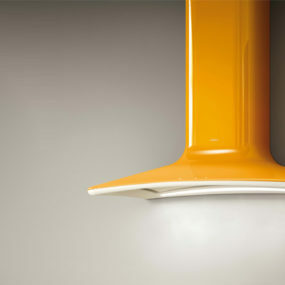 But this time there’s a more subtle, contemporary tone that we love. 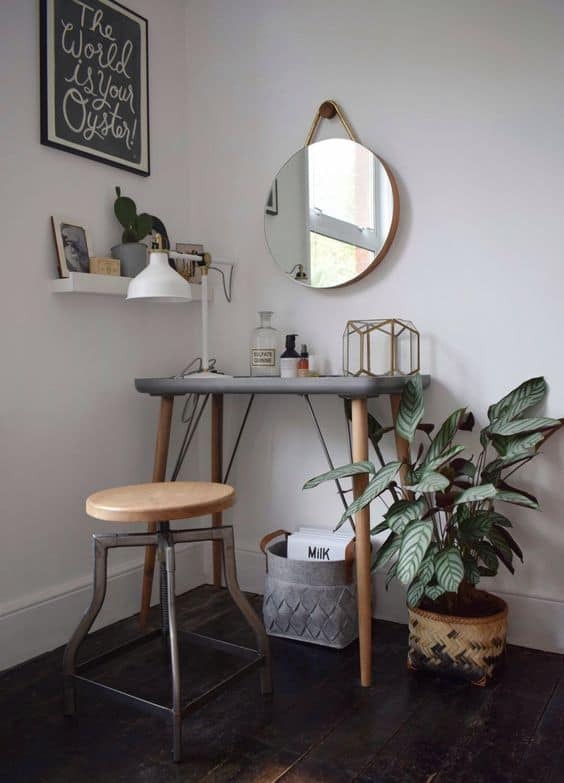 Topped off with a simple desk design, this corner of the room is full of style but also function. If you’re more inspired by things that are a bit more minimal in design and stripped down, then check out this industrial area from Design Soda. 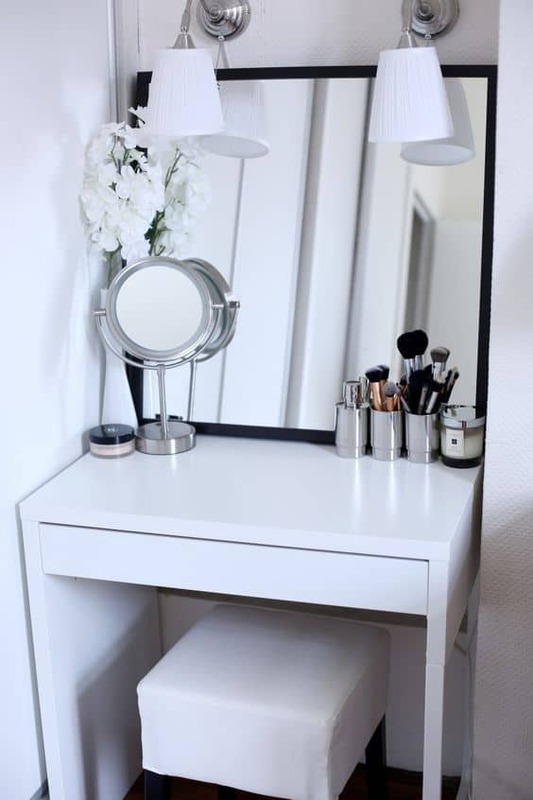 It’s just another beautiful example of how to create a corner of your bedroom and turn it into a vanity space that you love and fits your personal needs. 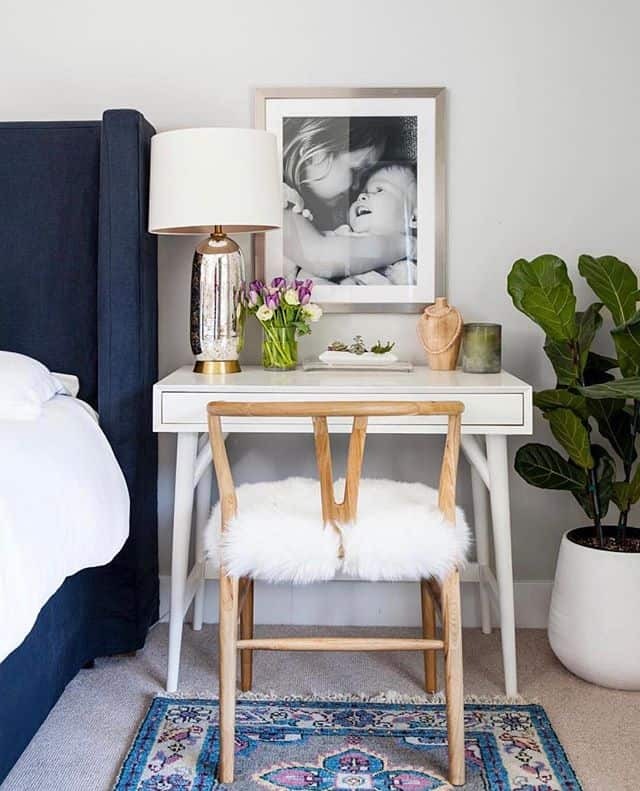 Corners don’t have to be just the nooks though, it could be the corner next to the window or the space directly next to your headboard that you want to utilize. 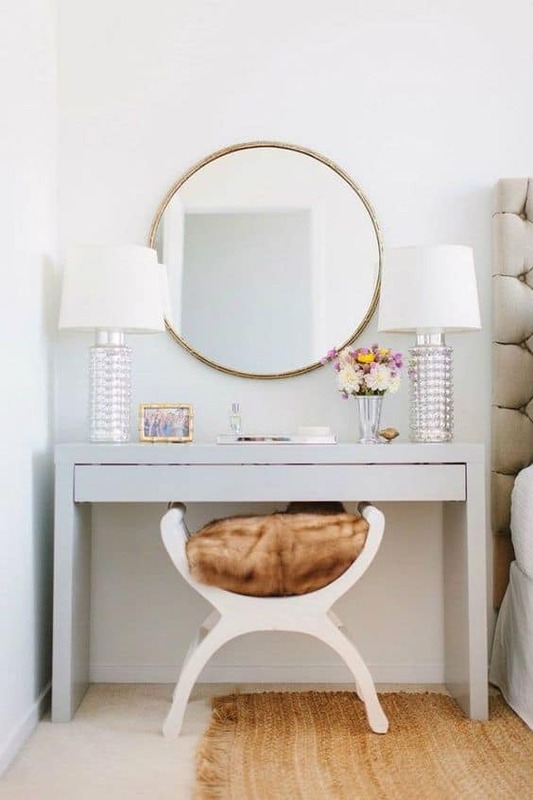 We’re swooning for this simple, yet feminine, design we found over at Brit + Co. Again, lots of textures and it can be used as a nightstand when it’s time for bed and a vanity come the morning. If you’ve got a larger master suite you’re working with, then a desk design that’s a bit bigger can work in the corners too. Just look at this spread from Harper’s Bazaar ! A bit of cottage flavor and Victorian accents, you have everything you need next to the window for natural lighting but tucked away from the rest of the room’s essentials. 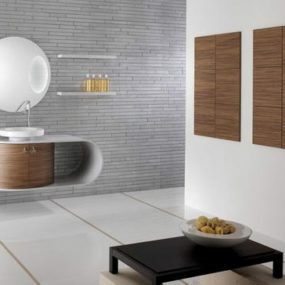 And finally, here’s another space that works inside the actual bathroom. 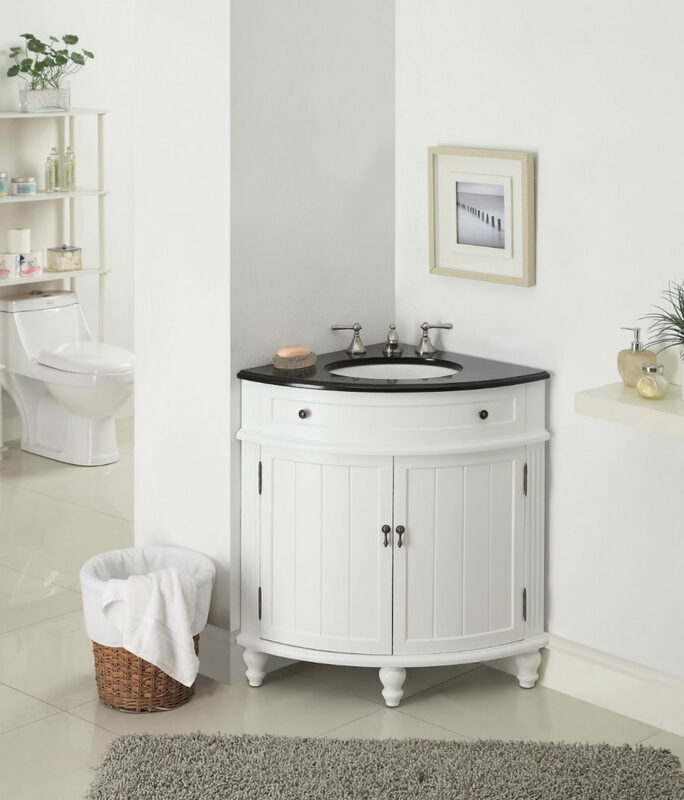 A corner vanity – that includes a sink – can easily be installed with your bathroom revamp. Depending on your personal needs and the space you’re working with, this could be exactly what you need!